Posted on Sun, Jan 22, 2012 : 12:01 a.m.
Redbud (Cercis canadensis) flowers add a much-needed spark of color to an early spring landscape. When you think about popular, colorful ornamentals, Eastern Redbud (Cercis canadensis) often comes to mind. It's a real crowd-pleaser, with a graceful, ornamental shape that puts out a "bouquet on a stem" look, with thousands of tiny pink/purple flowers lining its branches in early spring before its leaves emerge. And, the best thing about it is, it's native to southern Michigan, as well as most of the eastern half of the United States south of here. Furthermore, as a member of the Pea family (Fabaceae) it's a cousin to the previous pod-producers we've learned about, Honeylocust (Gleditsia triacanthos) and Kentucky Coffeetree (Gymnocladus dioica). Let's learn more about this colorful little native. 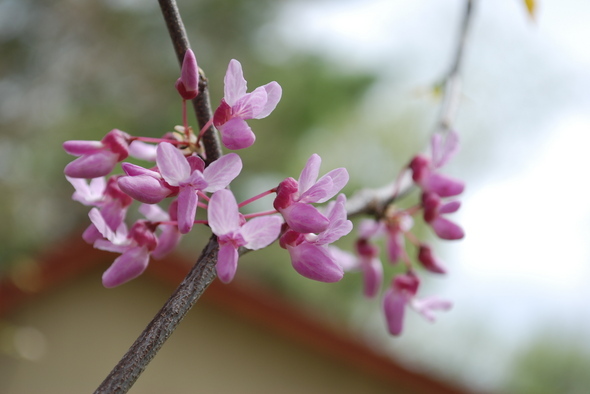 As mentioned before, Eastern redbud is native to southern Michigan, occurring naturally up to a line across the lower peninsula from Kent County to Genesee County. Nationally, it occurs naturally in an area extending from Maryland and the Carolinas west to eastern Kansas through Texas, including all of the southern states and northern Florida. Of course, because it's a pretty little thing, it has been planted in areas beyond its native range. If you want to use it in your landscape, it is fairly flexible in terms of where it will grow. It naturally occurs in rich soil along stream and river banks but is tolerant of a wider range of conditions. It likes sun or partial shade and can do well in most soils except waterlogged soils and dry, sandy soils. A landscape architect friend of mine once tipped me off that, if you want to plant this tree in your yard, make sure it comes from a northern nursery (such as Wildtype) because trees from southern nurseries often are killed off by our cold winters. In terms of the tree itself, it may reach a height of 15-25 feet with a spread about the same. It achieves its characteristic vase shape fairly early in life and is often multi-stemmed. The Michigan State Champion Big Tree of the species is in the front yard of the Annapolis Hospital in Wayne (33155 Annapolis Road). It’s about 26 feet high and 35 feet wide. Redbud's leaves are heart-shaped, almost round, reaching a diameter of about 3-4 inches and emerge after the flowers are pretty well gone. In the fall they turn a nice shade of yellow, but once they change color, they don't stay on the tree very long. The flowers (and buds) give the tree its primary common name. Each little pea-like flower is not all that big (about three-quarters of an inch), but the plethora of pink flowers along its branches makes this one of the showier native trees we have. You have to be patient, though, as a tree has to be about 7 years old to make much of a spring showing. They bloom in late April to early May. The flowers seem to be mainly on younger stems so as a tree gets older, you don't see as many along the main stems, but the stem bark takes on a nice cinnamon brown, scaly texture that is attractive in its own right. Since this is an article in a series about pod-producers, we need to talk about its seed pods. Each flower makes a flat, brown seed pod about 3-4 inches in length that may hold 4-10 seeds (which are quite good at self-seeding and growing new trees around the parent). 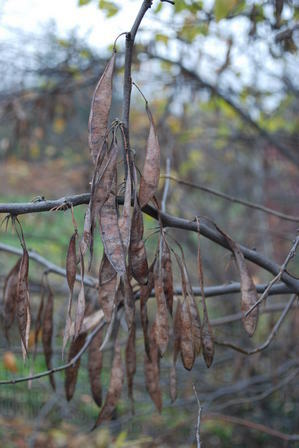 This tree's pod is similar to that of the non-native (to Michigan) Black Locust (Robinia pseudoacacia), but the redbud's pod is pointier at the ends. A cluster of pink redbud flowers led to this cluster of brown seed pods, which will most probably result in a cluster of redbud seedlings somewhere else in our yard. Eastern redbud does have another, less common name, which is Judas Tree. Apparently legend has it that Judas Iscariot hung himself from a redbud tree, but it was a different species (Cercis siliquastrum) as our redbud does not grow over in Judas' territory. Another fun fact about this tree is that it had a number of uses by Native Americans, ranging from an infusion of the bark for congestion, fever and vomiting, to use of the wood for handles and bows, to many uses of parts of the tree for basket-making. Some would also roast the pods and eat the seeds. Eastern redbud has two places in our little yard, and if I had more room, I'd add more. I enjoy its flowers, shape and shade, birds enjoy its seeds and bees, butterflies and hummingbirds go for its nectar. It can make an outstanding addition to your yard, too. It's a great day to get out and enjoy the shapes and shadows of winter, so get out and enjoy it everyone! Rick is a local landscape architect with a special interest in all things natural, including creating designs that include a lot of native plants (and the critters they support). You can contact him at yourland1824@gmail.com. Mon, Jan 23, 2012 : 8:04 p.m.
Because, as Rick notes, it take some years for redbuds to flower, if you can afford it, it's worth buying one that's at least a few years old. In 1999, I got one that was already 5 or 6 feet tall for my front yard. It now provides shade for the front porch. I LOVE redbuds. The flowering time is spectacular, and the leaves are truly lovely. Mon, Jan 23, 2012 : 2:52 p.m.
And they are tasty! Those young buds are edible. One of my favorite things to do in the spring is canoe the Huron, and find a tree over the river, and pick a few handfuls of buds to munch on. It is one of the early edibles around here.